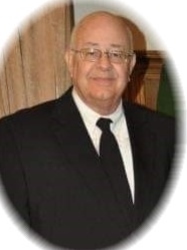 Reverend James W. Kennedy age 74 of Griffin, passed away Friday, February 1, 2019 at Well Star Spalding Hospital. Reverend Kennedy was born in Anniston, Alabama on February 15, 1944. He is preceded in death by parents Reverend Leland and Elouise Kennedy; his siblings, Leland Kennedy, Jr., Ronnie Kennedy, George Kennedy, Sr., Cathy Renna. Reverend Kennedy was retired Assembly of God Pastor former Presbyter and served on the Credentials Committee, he his wife had served at several churches among them, Pearson Goodwill Assembly, Pearson, Georgia, Lyons Faith Assembly in Lyons, Georgia, St. Mountain Assembly in St. Mountain, Adel Assembly in Adel, Georgia, Lakeside Assembly in Moultrie, Georgia, Cornerstone Assembly in Griffin, Georgia, Rehoboth Assembly in Toccoa, Georgia, after his retirement he open and operated the Kennedy Insurance Agency. He was a member of the Family Worship Center in Griffin. Survivors include his wife of 52 years, Brenda E. Kennedy; daughter, Vanessa Levert; son, Bert Kennedy and wife, Sheree; grandchildren, Britt Ropson and husband Matthew, Kalee Kennedy, Sarah Grace Levert, Ava Kennedy, Leland James Kennedy; nieces and nephews also survive. A visitation will be Sunday, February 3, 2019 from 3:00 pm until 5:00 pm at Conner-Westbury Funeral Home. A funeral service will be on Monday, February 4, 2019 at 2:00 pm in the Chapel of Conner-Westbury Funeral Home.